Twenty-two volumes (25 cm), in the publisher’s bindings, as issued. 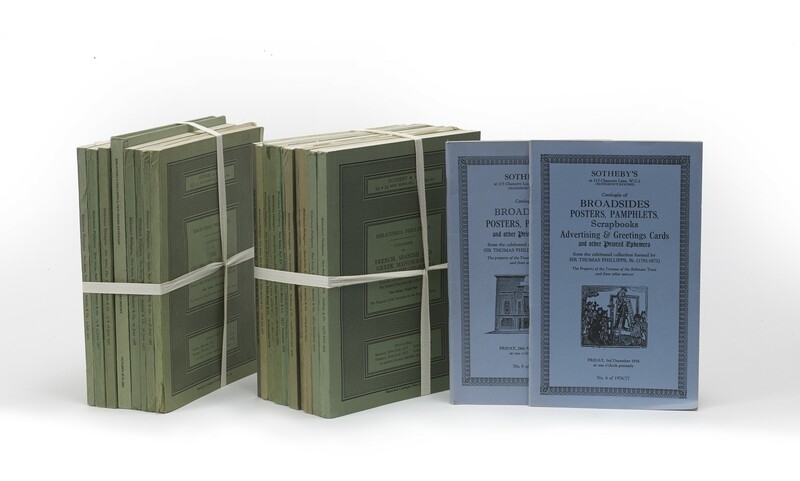 - Parts 1-20 of the sale catalogues of Phillipps manuscripts and printed books. ¶ Very good, unmarked copies. Some Price Lists are lacking. Offered with Catalogue of broadsides, posters, pamphlets, scrapbooks, advertising & greeting cards and other printed ephemera from the collection formed by Sir Thomas Phillipps, Bt. (1792-1872); the property of the Trustees of the Robinson Trust and from other sources (catalogue of a portion of the Phillipps Library sold by Sotheby Parke Bernet & Co., Hodgson’s rooms, Chancery Lane, London, 3 December 1976). ¶ Very good, unmarked copies. (25 cm), 135 (1) pp., frontispiece and 7 leaves of plates (inserted after pp.8, 14, 18, 48, 94, 100, 104). Lots numbered 1-301. List of prices realised and buyers’ names loosely inserted. Publisher’s printed wrappers. - Includes the papers of Françoise de Graffigny (lots 122-126; bought by H.P. Kraus, and presented by him to the Beinecke Library in 1968) and “Robert Herrick’s poetical commonplace book” (lot 146; bought by House of El Dieff for £34,000; now University of Texas at Austin, HRC 79, and no longer regarded as Herrick’s). ¶ Unmarked copy. (25 cm), 125 (3) pp., colour frontispiece, 6 leaves of plates (inserted after pp.4, 24, 34, 48, 66, 122), text illustrations. Lots numbered 302-561. List of prices realised and buyers’ names loosely inserted. Publisher’s printed wrappers. - Includes a manuscript of the first part (books 1-9) of Caxton’s translation of Ovid (lot 318). Discovered by the auctioneers in separate sheets amongst a quantity of valueless material, it was sold for £90,000 to the New York dealer Lew David Feldman (House of El Dieff). The Reviewing Committee on the Export of Works of Art placed a temporary embargo on its export, to give British institutions a chance to match the purchase price, and reunite the two parts (Books 10-15 are in the Pepysian Library at Magdalene College, Cambridge). Thirty-six hours before the embargo expired, Eugene Power, founder of University Microfilms, offered Magdalene College a £71,000 loan, to be repaid from the proceeds of a facsimile edition planned by the New York publisher George Braziller. Cf. John Carter, “The Caxton Ovid” in The Book Collector, volume 20 (1971), pp.7-18; Edition of one: the autobiography of Eugene B. Power, founder of University Microfilms (Ann Arbor 1990), p.271, etc. ¶ Unmarked copy. (25 cm), 142 pp., 15 leaves of plates (inserted after pp.8, 16, 22, 46, 54, 64, 66, 80, 84, 86, 106, 110, 112, 114, 126), text illustrations. Lots numbered 773-926. Publisher’s printed wrappers. 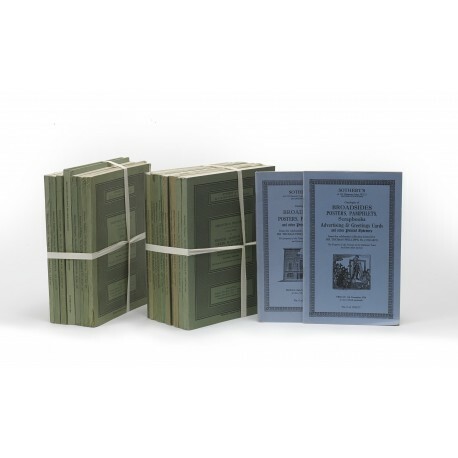 - Includes (lot 865) a collection of manuscripts in 620 volumes assembled by Count Annibale Ranuzzi (1625-1697) and (lots 908-926) the archive of the Vettori family of Florence. ¶ Unmarked copy. No Price list. (25 cm), (8) 164 pp., folding colour frontispiece, text illustrations (2 folding). List of prices realised loosely inserted. Lots numbered 927-1158. Publisher’s printed boards. - Illustrated on the colour frontispiece is the map of the Americas in Edward Norgate’s coloured copy of the 1584 Ortelius Théâtre de l’Univers (lot 1102). ¶ Unmarked copy. (25 cm), (6) 149 (3) pp., frontispiece in black & white, text illustrations. Lots numbered 1159-1374. Publisher’s printed wrappers. ¶ Unmarked copy. No Price list. (25 cm), (4) 165 (1) pp., 6 leaves of plates (inserted after pp. 20, 28, 64, 134, 140, 146), text illustrations. Lots numbered 1375-1709. List of prices realised and buyers’ names loosely inserted. Publisher’s printed wrappers. ¶ Unmarked copy. (25 cm), 125 (3) pp., text illustrations. Lots numbered 1710-1905. List of prices realised and buyers’ names loosely inserted. Errata sheet (”Lots 1847 to 1905 inclusive will be offered as a single lot”). Publisher’s printed wrappers. - The sale included a vellum roll purporting to be 2000 years old and to contain the first three books of the Iliad, a forgery by Constantine Simonides, who sold it to a credulous Phillipps in 1853 for £50 (bought here by Quaritch, £750; now Tokyo, Takamiya Collection). “A hitherto unknown poem of 3,000 lines concerning the battle between the Venetians and the Turks over Cyprus in 1570-73 reached £1,900 and was bought by the Athens Academy. A series of early chronicles concerning Venice were sold for £13,000 to the Italian Institute on behalf, it is believed, of the Biblioteca Marciana in Venice. The autograph manuscript of a fifteenth century chronicle of Vicenza was also bought by the Italian Institute for £2,400 for the Vicenza communal library (from a saleroom report by Geraldine Norman, in The Times, 5 July 1972, p.18). ¶ Unmarked copy. (25 cm), viii, 181 (3) pp., text illustrations. Lots numbered 1906-2221. Publisher’s printed wrappers. ¶ Unmarked copy. No Price list. (25 cm), 156 (4) pp., text illustrations. Lots numbered 2222-2541. List of prices realised and buyers’ names loosely inserted. Publisher’s printed wrappers. ¶ Unmarked copy. (25 cm), 154 (2) pp., text illustrations (one folding). Lots numbered 2542-2829. List of prices realised and buyers’ names loosely inserted. Publisher’s printed wrappers. ¶ Unmarked copy. Price list tipped-in with clear tape. (26 cm), 154 (2) pp., text illustrations. Lots numbered 2830-3085. List of prices realised and buyers’ names loosely inserted. Publisher’s printed wrappers. ¶ Unmarked copy. 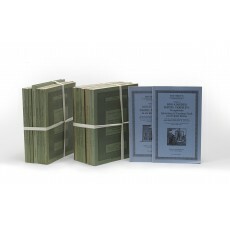 (25 cm), 170 (2) pp., text illustrations (one folding). Lots numbered 3086-3388. List of prices realised and buyers’ names loosely inserted. Errata slip loosely inserted (lot 3205). Publisher’s printed wrappers. - Includes (lot 3205, bought by Quaritch for £9500) a complete copy of William de Machlinia’s Vulgaria quedam abs Terencio in Anglicam linguam traducta in a contemporary binding copying a Winchester Romanesque model. ¶ Unmarked copy. (26 cm), 82 (2) pp.,  leaves of plates (inserted after pp.20, 22, 44, 46, 78), text illustrations. Lots numbered 3389-3555. Printed list of prices and buyers’ names. Publisher’s printed wrappers. ¶ Unmarked copy. No Price list. (26 cm), 86 (2) pp., frontispiece, text illustrations. Lots numbered 3557-3864. Publisher’s printed wrappers. ¶ Unmarked copy. Photocopy of List of prices and buyers’ names. (25 cm), (4) 151 (3) pp., text illustrations. Lots numbered 3865-4170. Publisher’s printed wrappers. - The Spanish ambassador attended the sale in person and bought 73 lots in all for a total of £16,109 on behalf of the National Library, the archives of the Ministry of Foreign Affairs, and other Madrid libraries (report in The Times, London, 29 June 1976, p.3). ¶ Unmarked copy. No Price list. (25 cm), 84 pp., frontispiece,  leaves of plates (inserted after pp.10, 34, 38, 82), text illustrations. Lots numbered 4171-4521. List of estimates loosely inserted. List of prices realised and buyers’ names loosely inserted. Publisher’s printed wrappers. ¶ Unmarked copy. (25 cm), 77 (3) pp., frontispiece,  leaves of plates (inserted after pp.4, 12, 18, 22, 26, 52, 62, 74), text illustrations. Lots numbered 4523-4816. List of estimates loosely inserted. List of prices realised and buyers’ names loosely inserted. Errata sheet (Lot 4659: “All references to notes in Sir Isaac Newton’s hand, together with the suggestion that some early volumes belonged to him, should be deleted from the description of this lot”). Publisher’s printed wrappers. ¶ Unmarked copy. (25 cm), 161 (3) pp., text illustrations. Lots numbered 4817-5144. List of estimates loosely inserted. List of prices realised and buyers’ names loosely inserted. Publisher’s printed wrappers. ¶ Unmarked copy. Edges of wrappers sunned. (25 cm), 121 (3) pp.,  leaf of plates (inserted after p.82), text illustrations. Lots numbered 5144-5625. List of estimates loosely inserted. List of prices realised and buyers’ names loosely inserted. Publisher’s printed wrappers. - A further, unnumbered sale of 2109 lots was held four years later: Bibliotheca Phillippica : Catalogue of English Charters and Documents from the Twelfth to the Nineteenth Century (Sotheby’s, London, 13 April 1981). ¶ Unmarked copy. (24 cm), 86 (2) pp.,  leaves of plates. 263 lots. List of estimates loosely inserted. Publisher’s printed wrappers. ¶ Unmarked copy. No Price list. (24 cm), 61 (3) pp.,  leaves of plates. 215 lots. List of estimates loosely inserted. List of prices realised and buyers’ names loosely inserted. Publisher’s printed wrappers. - The last lot in the sale, a collection of 467 Valentine’s Day cards, dating between 1840 and 1900, made £2900. ¶ Unmarked copy.